The client does not send any requests, the channel being created upon connecting to the server. The server sends multiple responses through the channel. It is identified by a specific icon in the User Path actions. the RTMP channel activity is suspended pending the next server response, that is to say it prevents the Virtual User continuing its execution thread as long as the response has not been received. Each time a response is received, the variable extractors and assertions placed on the request are executed. 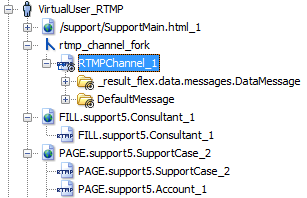 The RTMPChannel_1 logical action is used to execute the RTMP channel in a secondary execution channel in the User Path. For more information, see Fork. NeoLoad natively handles Push technologies, including RTMP. For more information about the Push technologies supported by NeoLoad, see Push frameworks and RTMP streaming. For more information about streaming, see Streaming requests.